Hermes was a handsome Greek god and Aphrodites was a beautiful Greek goddess and they were so perfectly matched, reflected each other so perfectly, that their union in love gave birth to Hermaphroditus. A picture of him/her can be seen on the last card in the Major Acana of the Greek Mythic Tarot – ‘The World’. 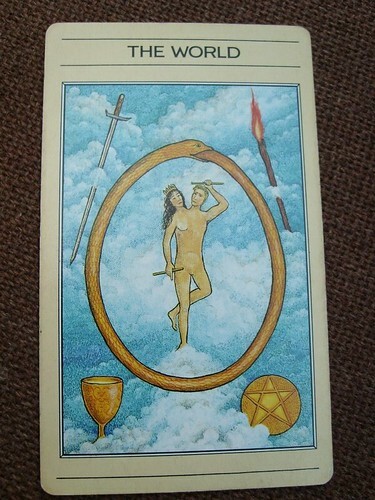 The teaching of this card in the Tarot is one of balance, unity, perfection and being whole. The four elements of earth, water, fire and air come together as a perfection of creation through the evolution of all the human aspects: the physical being, the intellect, the imagination and the emotions. Beauty is seen as the imaginative and logical mind working creatively together and unconditional love as the expression of the enlightened spiritual being through the earthly human being. Let us imagine for one moment a simple possibility. If the ‘Whole’ is all the aspects of life between the poles of gender existence, from one extreme, masculinity, to the other, femininity, together in Oneness, and the separation of these two polarities is for the purpose of evolution, experience, knowledge and Self-consciousness, the journey away from and back to the ‘Whole’ is ‘Life’. From the beginning of Time, back to the end of Time, we can explore ‘Life’. The polymorphic reproduction of life is what life on earth is all about, and this is the source of our anxieties about genetic interference, modification and cloning. Somewhere on this journey, we, as human beings, will experience being male or being female, with the potential to be the other in recession. The moment we become conscious of the opposite state hidden within us, we find ourselves in a position of choice. We can be one or the other, or both, to any degree at any one time. Picture the Managing Director of a Global Conglomerate wearing high heels and lipstick. The two aspects wouldn’t normally go together, in our view of a male and female world, but it has already happened. Imagine a six foot muscular, hairy truck driver feeding the baby. Again, another strange situation to imagine, yet I am sure there are some nurturing truckies out there. But why? Does a woman have to lose her femininity to rule in a ‘man’s world’; and does a man have to lose his masculinity to participate in a ‘woman’s world’? We allocate these roles to each gender purely because the traits of the gender lend themselves more easily to the role. But should that rule out the choice to swap roles? Likewise, in a less extreme situation, can boys and girls both learn to cook and play football? Of course they can. But can men wear women’s clothes? Can women wear men’s clothes? Absolutely! In fact many men find women in dungarees and a hard hat very attractive and I have to admit the long dark locks and silk shirt of a Regency dandy quite appeals to me! Why? Because the sexuality/gender of the person is not only about what we wear. I have seen many strong, non-high-heels-and-lipstick feminine women become mothers, go about their career, choice of life-style or activity without any criticism. And there are many non-hairy, non-muscular men who are beautiful and soft and still very male and good fathers. Since the very early beginnings of theatre, men and women have changed roles. The Greek Mythologies are full of men being women and women being men. Pantomimes still play with this form of entertainment. Angels are seen as being neither male nor female and both together. They are perceived as tall and strong, wise beyond our knowing, gentle and kind and beautiful, handsome and graceful. They are pure Light. [Actually I see them as vibrating webs of golden thread, patterns of conscious intelligence and not human in form but that’s another story]. There are, however, areas of modern life where men and women who act out-of-role, or feel differently and wish to live honestly with that, incite the wrath of public opinion; they upset the proverbial apple cart and seem to present some gender blurring, or morality questions we should be finding a solution for. It is just a matter of being open-minded, thinking outside-the-box for a moment. If a person’s appearance upsets us then we are living in the wrong century! Surely, by now, we have enough diversity in personal taste, physicality, fashion, culture and national differences to be tolerant to anything new and different. In the world of art, there is a direct intention to re-create what we already know into new concepts. In the world of fashion, the haute-couture designers push out and destroy the boundaries of conventionalism every day. So it is not so much about what we look like. There seems to be something else more subtle and hidden that will make us feel a gender difference is uncomfortable, or wrong in some way. This week has seen a first in the world of the internet: the online debut of the works of Charles Darwin. ‘HE who wishes to decide whether man is the modified descendant of some pre-existing form, would probably first inquire whether man varies, however slightly, in bodily structure and in mental faculties’. If nothing else, Darwin set out, over a life-time, to study the effect of time on living things. He observed so much diversity that he suspected a natural law at work which aroused his curiosity. How did living creatures become so different? The more he looked the more diversity he found. His conclusion was that we are evolving, changing all the time, according to the influences of living in this world and with each other. He concluded that it was inevitable that we would change. I wonder if he ever thought that what he was observing on his travels was a prototype, a work in progress, or an end result? The human embryo in its first stage of gestation is neither gender; it is an androgen [although some say the cells are actually female, probably because they are being created within the female body], but at around 8 weeks, one gender is favoured. This primary stage is a living replica of the primary stage in the evolution of life on Earth and each stage of development of the young embryo, foetus, baby and child replicates the evolution of man, through all the animal forms. The toddler is demonstrating the time when we, humans, stood up and became erect. We are continuing this evolution now. It may just be, hypothetically, that the end result will be a hermaphrodite, the male and female in one body, able to reproduce asexually. Do we as humans have an arrogance about us being an end result, the top of the class, perfection? I don’t honestly think the majority of human beings think that. But some seem to think that their opinion is correct and final. If religion has any positive role to play I shall expound my theories on it another day. One development of religion is that it gives some folk the right to judge others. If they are not matching the model of their religion, all others must be faulty. Enough said. In the urge to criticise and judge, we humans show a lack of understanding about how we perceive another. We don’t like to feel uncomfortable and if we have to witness someone very different to ourselves, we feel threatened in some way and the first line of defense is attack. This is a primal reflex to a stranger, something unknown and different – not a member or our clan or tribe. But when we judge it to be wrong, we are not recognising the possibility that that trait is in us too. What I would like everyone to think about is this: If there is going to be diversity in this world, and that diversity has a purpose, then we should not be criticising any form of life. Whatever gender, male or female, male/female, female/male, colour, shape, size or height we happen to be we may be perfection-in-the-making. Whatever gift, talent, style, view, expression we happen to have we may be perfection-in-the-making. But if anyone of us is having a bad day, suffering, in pain, lost, lonely or sad, we may have forgotten that we are perfection-in-the-making and may need a little help and a little tolerance and understanding from others. If you are feeling good about yourself, smile and let the world know that you are seeing your perfection-in-the-making today and if you are struggling, just remember these words, and ask for help.